Prepping the butter lettuce: Wash and spin dry the whole butter lettuce leaves. Shred the lettuce (see tips). Set aside. Prepping the avocado: Peel the avocado, remove the pit it and cut into cubes. Drizzle them with 1 tablespoon lime juice to avoid oxidation. 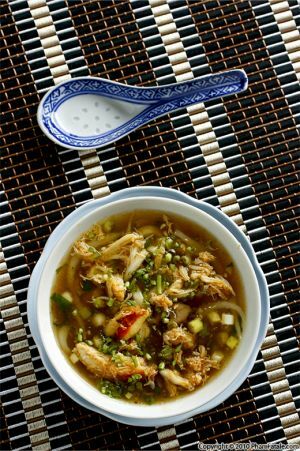 In a bowl, dissolve the agave nectar in 1 tablespoon lime juice. Add the mustard, wasabi paste, mayonnaise, coconut milk and 1 tablespoon olive oil. Season with salt and set aside. Clean the crabs, brush and rinse thoroughly. Place in a pot, add about 1 to 1-½ cups of water and bring to a boil for about 10-15 minutes (see tips). Transfer to an ice water bath for about 3 minutes to stop the cooking process. Drain and discard all the liquid. Remove and discard the abdominal flaps (the triangle-shaped tail). Lift and separate the back-fin with the rest of the claws by placing a large tablespoon at the bottom of the crab. Remove and discard the "lungs" (also known as Devil's fingers); they have a spongy texture and are inedible. Gently remove the crab meat from the back-fins (the inner chambers are filled with meat). Gently crack the claws using a meat tenderizer mallet and gather all the crab meat in a large mixing bowl. Add garlic chives, tarragon and 1 tablespoon lime juice. Note: Try to gather large crab pieces for an appealing presentation. Add the eggplant, roasted green bell pepper, avocado and tomatoes to the crab bowl. Toss well. 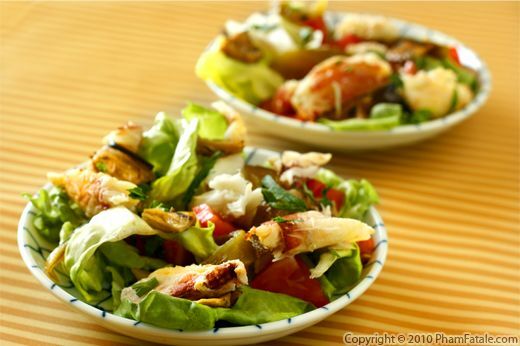 Serve the crab salad on a bed of lettuce or in soft sandwich rolls. 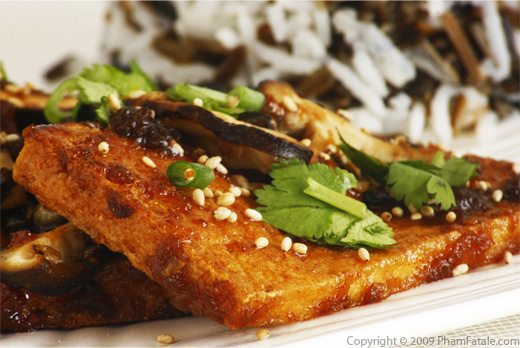 Serve with the wasabi coconut salad dressing on the side. You could add mussels to the salad if you like but my little munchkin doesn't like them. I made the salad with the vegetables available in the refrigerator. 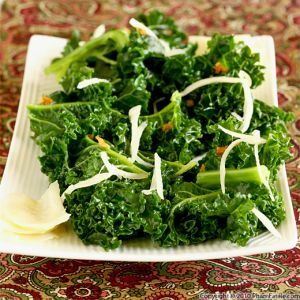 You could add celery, hearts of palm or any other greens. 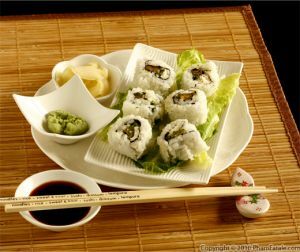 If wasabi is too spicy to your taste, you could add raw red onion for a mild spicy flavor. It's important that you do not store tomatoes in the refrigerator because it might alter their flavor. I used leftover grilled eggplants. The day before, I had made some roulés d'aubergines au chèvre, literally goat cheese eggplant roll-ups in English. To prevent the lettuce from wilting too fast, try not to cut the lettuce with a knife. I usually tend to just gently tear the leaves; that way the salad will remain fresh until it's ready to serve. Other tip: pour the salad dressing at the very last minute (or serve on the side) to keep the salad crunchy. 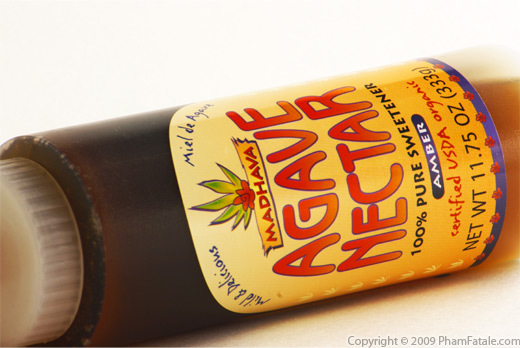 Agave nectar is a natural sweetener. You can find it in specialty stores such as Whole Foods and in many regular grocery stores. Agave nectar is made out of the purified sap of cactus-like desert plants. This salad is perfect if you're hosting a buffet-style party. It's a time saver. You can prepare all the ingredients in advance and store them in the refrigerator until you're ready to serve. Published By: Jacqueline Pham on July 25, 2010.